Maintain Clean, Healthy Air Quality Where You Are Working with This Top-Rated Portable Source Capture Air Purification System! Here we offer One of the Best Combination Fume Extractor and Dust Collectors with Best Quality HEPA & Activated Carbon Filters that Quickly Capture Harmful Gases, VOC's, Odors & Particles in Rooms, Workshops & More, All at a Cheap Discount Price with Free Shipping! Harmful toxins and off-gassing... is present where art conservation and restoration takes place. Museums, galleries and archival institutions housing artifacts, artwork and historical documents should be as concerned with the health of their conservators as they are with the treasures they save. The Clean Breeze III D Vocarb captures chemicals & odors more effectively and offers longer carbon filter life than the standard Clean Breeze unit. This is due to the extra thick activated carbon filter and 6 more pounds of super-activated Vocarb industrial strength carbon. The Clean Breeze III D Vocarb also captures 99.99% of particles as small as 0.1 microns--and captures all pollutants directly at the source to keep your artifacts and employees safe. Electrocorp’s precision air cleaning with Source Capture, flexible arm and Carbon+HEPA technology for both gaseous (chemical and odor) and particle contaminants is all about removing airborne particles and chemicals. 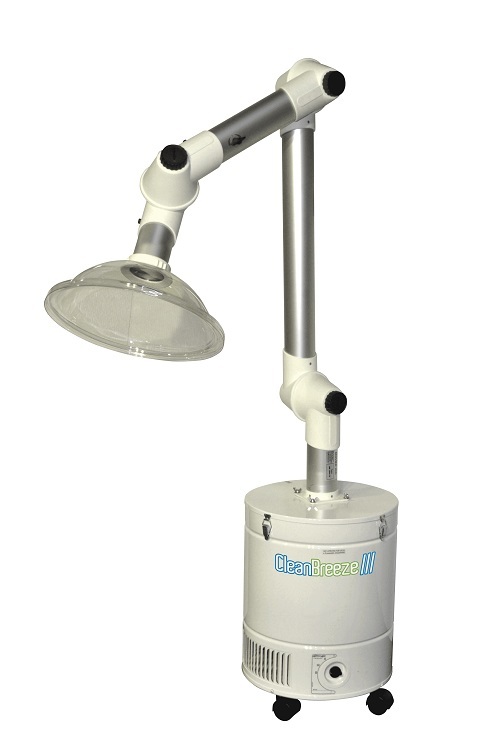 The Clean Breeze III is designed to capture harmful airborne contaminants at the source. Equipped with pre-filters, micro-HEPA and an activated carbon filter that offers more inches of filter depth, the Clean Breeze III captures more chemicals, gases, odors and particles than ever before.